I was on Hawaiian Time when the Tiny House Collaborative launched, so I haven't yet taken the time to tell you how very excited I am about being part of this group of fabulous people. The short answer is pretty freakin' excited! The Tiny House Collaborative is a team of 7 individuals, each passionate about providing the resources to design, build and dwell efficiently. 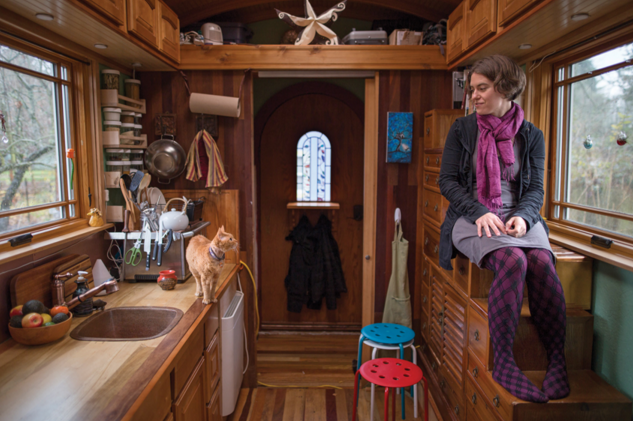 We are combining our energy, time, and expertise so that we can more effectively share our love of tiny homes and our collective knowledge of living well in small spaces. It's a synergistic relationship because we can do more together than any one of us could do alone. So how did this group of people all join up? We think it was a little bit luck/fate/coincidence and a little bit being brave enough to act on our mutual friend crushes. When we all arrived in Colorado for the 2015 Tiny House Jamboree, we decided to kick off the weekend with a hike. We got to talking about what each of us were doing in the Tiny House Movement and how it was hard to do it alone. By the end of the hike, the seven of us had decided we had to find a way to combine efforts. And just like that, the Tiny House Collaborative became a twinkle in our eyes. In December we gathered up to Visit Orlando Lakefront RV & Tiny House Park to explore the city where James and Kai live. We turned the trip into a retreat to figure out the details and prepare to share the Tiny House Collaborative with everyone else. That means YOU! We have created a website where you can learn more about the Collaborative and sign up for the services we currently offer. Please know there are many more good things to come! I recently returned from a much-anticipated 9-day vacation in Hawaii with Isha, The Guy Next Door. I’m in that happy in-between space where it’s so nice to have been gone and so nice to be home again! And I feel like I may still be on Hawaiian Time, which is much more easy-going but not always compatible with the mainland flurry! We arrived in Honolulu super late on Saturday night a couple weeks ago and were greeted in Waikiki by Isha’s college pal Henry, who hosted us while we were there. And when I say we were greeted by Henry, I mean, Henry, a couple of cold beers, and a bag of Maui onion potato chips. For those of you unfamiliar with the trio, these may be the three best things to be greeted by on a hot January day in Waikiki after a long flight! The past couple years Henry has worked a few months in Hawaii and he’s told Isha that he’s welcome to come stay with him during those times. This year, thanks to some frequent flyer miles, we were able to take him up on the offer, making our vacation a relatively frugal one AND enabling us to have fabulous company! Sunday is Henry’s one day off each week, so in the morning Isha and Henry headed out for a surf. I enjoyed a lazy start to my day, wandered Waikiki, and picked up some groceries at the market (some of which I’d never seen before – soursop smoothies, anyone? Mmmm!) I also prepped for and taught my weekly Downsizing E-Course. These call-ins are fun no matter what, but I’ve got to say it was especially nice discussing downsizing philosophies from our 21st floor Waikiki hotel room! That night Henry showed us one of his favorite Japanese restaurants in Waikiki and I enjoyed the best sushi and sake I’ve ever had. Scrumptious! Monday morning we started out the week with a smoothie on the beach, a swim, and some home-cooked breakfast before packing up our stuff to head to our new lodgings on the North Shore. We stopped along the way in Chinatown where we explored shops and markets and stocked up on ingredients for a week’s worth of home-cooked meals. Then we visited Pearl Harbor, which was a fascinating encounter with rhetoric and culture. On our drive to the North Shore where we stayed the rest of the trip, we stopped at Waimea Bay because everyone and their auntie was doing the same. The waves were massive so it was fun to watch the pro surfers and speculate about whether or not the Eddie surf competition would run. As we were nearing Sunset Beach we gave Henry a ring to let him know we were close and he said “I hope you like watching whales breach in 35 foot waves, because that’s what I’m doing right now from the deck!” Um, yes, please! Don’t mind if we do! Our dinner plans were back-burnered. Instead we sat out on the deck, drinking Coronas with lime and eating peanuts (acquired in Chinatown at a preposterous bargain!) and visited with Henry while watching the waves and the sunset. I was certain that I’d be working from Hawaii since most of my trips are work-related in some way and I try to do maintenance work to keep up. But there’s something about Hawaiian Time that allowed me to really settle into having an actual vacation. Was it the waves? The sunshine? The humidity? The tropical fruit smoothies for breakfast? The salt water on my skin after a morning swim? Whatever it was, it felt luscious. The days started to blend together in a lovely swirl of tasty food, warm sun, big waves, dream-filled sleep, yoga classes, and visiting with friends and family. Isha and I enjoyed some quality time and the chance to make more memories of our adventures together. Another of Henry’s friends stayed for five days during out trip and the fellas all surfed together every chance they got (which means I got a crash-course in surfer lingo – nothing like immersion, right!?) My sister who lives in Kauai came to visit for three days. She and I caught up while walking in the neighborhood, hiking to the top of Diamond Head, and wandering Waikiki. My friend and former Less is More student Maile and her husband Kevin were also on Oahu so we connected for lunch one day and she and Isha participated in our Downsizing E-Course from our beach house. We also enjoyed trading tasty meals with Henry’s friends and their 6-month-old cherub (I’ve never seen such a happy baby! Then again, growing up in Hawaii does seem to have that effect on people!) We were grateful for their local knowledge and their hospitality as they shared a soft top surf board for my first lesson, clued me in on the best yoga studio in the area, and introduced us to awesome swimming spots, local produce stands, and a fabulous Waimea Bay lookout, not to mention amusing us with the low-down on local celebrities. Although we joked about staying forever and promised to come back at the next chance, it was also great to come home to Simply Home Community, my precious little cat, and my beloved tiny house, The Lucky Penny. It feels good to be home again. And it’s been fun this week to do some project management for the upcoming Tiny House Build Blitz in Tucson and to be excited about the launch of the Tiny House Collaborative. Nine days in Hawaii was a lovely way to get some much-needed R & R and I intend to keep a bit of the Hawaiian Time I brought back with me. I have a renewed commitment to giving myself a Secular Sabbath each week. That feeling of spaciousness is lovely and I intend for it to linger beyond the macadamia nuts and the sun tan! It has been so much fun to see students getting psyched for the upcoming Downsizing E-Course! If you'd like to get in on this round of the Downsizing E-Course, please register today so that you can get started on your first challenge! You'll find the course description below. Special Deal: Sign up with an accountability buddy and you both get $10 off when you sign up and for each week that BOTH OF YOU complete the downsizing challenge, you’ll EACH earn a $10 rebate. This means that if you complete all 6 challenges you can earn $60 back in addition to your original $10 rebate! That’s right. This class will literally PAY YOU BACK if you do the assignments. But it only works if you BOTH do your challenge, so be sure to encourage each other along! What if were surrounded only by the things and people you love best? What if you had just the right amount of stuff and liked it all? What if you were cheered on throughout your downsizing process? At the Tiny House Jamboree in Colorado Springs, I met Alexis & Christian of Tiny House Expedition. They've been traveling for the past several months to make a film called Living Tiny... Legally, which explores how people across the country have worked with their cities to find ways to live legally in their wee homes. They're now running a Living Tiny... Legally Indigogo campaign to raise funds to complete the project. You can support this film so that tiny house enthusiasts and city officials have great examples of how to make tiny legal. Read on for more info from their website and then jump on over to the Living Tiny... Legally Indigogo campaign to make a contribution. This documentary will be YOUR FREE resource, to help YOU, the people that want to live tiny, live tiny legally... With YOUR HELP, this documentary can be used as YOUR tool to proactively further meaningful conversations with your local municipal planners and help make legal tiny housing a reality in YOUR community. Check out the Living Tiny... Legally Indigogo campaign to support this film by making a contribution! Tagged: Alexis & Christian, Kai Rostscheck, Living Tiny--- Legally, where can I legally live in a tiny house?, where is it legal to live in a tiny house?